The political, cultural and economical centre of the Czech Republic for over 1,000 years, Prague is now one of the most popular tourist destinations in the world, falling behind the cities of London, Paris, Rome, Madrid and Berlin as the sixth most visited European city. Prague is a much smaller city than the others though and as a result, the hordes of tourists swelling into the cobbled streets and onto Charles Bridge can be overwhelming, particularly in the peak summer season. The historic centre of Prague, comprising the Old Town (Staré Město), the Lesser Quarter (Malá Strana) and the New Town (Nové Město) was added to the UNESCO World Heritage list in 1992. The Lesser Quarter (Malá Strana). The other 14 districts can be organised into the following geographic areas. Northern Prague - Praha 7, 8, 9. Eastern Prague - Praha 3, 10, 14, 15. Southern Prague - Praha 2, 4, 11, 12. Western Prague - Praha 5, 6, 13. 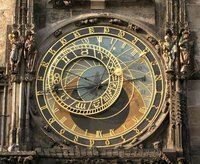 Astronomical Clock (Orloj) - It was designed and built before it was found out that the earth circles the sun. Thus it is not accurate. Still it does toll every hour with a display of wooden saints "conducted" by the clock's skeleton. Some Prague schoolchildren are taught how to read this clock, though many have forgotten it by the time they are out of school. It is located in Old Town Square. The Charles Bridge (Karlův most). Church of Our Lady Before Týn (Týnsky chrám). The Dancing House (Tančící dům) - Also known as the Fred and Ginger Building is a work of modern architecture designed by Frank Gehry. The address is Rašínovo nábřeží 1. New Town Hall (Novoměstská radnice). Old Jewish Cemetery (Starý Židovský hřbitov). Old Town Square (Staroměstské náměstí) - Located in Old Town this square was the home of the city's marketplace during medieval times and still today is the center of much activity. Prague Castle (Pražský hrad) - This castle is one of the largest castles in the world and a great sight. St. Nicholas' Church (Chrám Sv Mikuláše). St. Vitus Cathedral (Katedrála sv Víta) - St. Vitus is a stunning cathedral located in Prague Castle. Wallenstein Palace and Gardens (Valdštejnský palác). Jewish Museum - It is not actually a museum, but rather a group of six important Jewish sites including: the former Ceremonial hall, Klausen synagogue, Spanish synagogue, Pinkas synagogue, Maisel synagogue, and Old Jewish Cemetery. Museum of Decorative Arts (Uměleckoprůmyslové muzeum). The Prague Spring International Festival is all about music and performing arts, with a number of shows taking place around the city from mid-May until early June. The first event took place in 1946 and continues to grow in popularity every year. For literary lovers, this is often the highlight of the Czech events calendar, a two-month long celebration of arguably the finest playwright who ever lived. From June until September, Prague Castle is home to a series of performances which take place in the stunning Burgrave Palace courtyard. Held around various venues in Prague, including some of the large river islands, the United Islands Festival takes place from June 16 to 25. A celebration of the people and the quirks of Prague’s most interesting and mysterious cultures, the event is primarily a music festival, but is also an opportunity to explore the Czech Republic’s outlying islands. Things are cranked up a notch during the evening when events move to nightclubs and music venues, with partying, singing and dancing well into the night. This momentous music festival has become a key fixture on Prague’s cultural calendar and is one of the most popular events in Europe. Local Czech and international musicians and performers travel to the capital to celebrate the best of classical music, including big name stars with crowds attending by the thousands. The Verdi Festival is a month-long event celebrating stage arts such as ballet, opera, and theater. Held in September at the stylish Prague State Opera house, it’s a must-see for lovers of the classics. Three King's Day (06 Jan 2014) - A procession of camels and actors in costume takes place every year to mark Three King's Day, ending at a nativity scene in front of the Loreto. Although the actual day is on January the 6th, the procession is usually on the 5th. Anniversary of Jan Palach's death (19th of January) - Jan Palach was a student who burned himself to death, protesting the 1969 Soviet occupation. Liberation Day - The day that Prague liberated itself from German occupation in World War II. During soviet times, this was celebrated on May 9, the day the Red Army entered Prague. Prague sits literally in the "Heart of Europe" and lies between the more temperate Western European and more arid, continental climates. Some winters can be very snowy, others see relatively few days with snow and much milder conditions. The driest months are the winter ones; the wettest the summermonts of July and August with sometimes heavy showers and thunderstorms, mainly after hot days. Prague's averages range from minimum -5 °C in January to 23 °C in July. Ruzyně International Airport (PRG) near Prague services flights to destinations in Europe, North America, the Middle East, Asia and Africa. Czech Airlines, the national flag carrier, has its main hub here and serves many destinations, including Almaty, Beirut, Belgrade, Bucharest, Cairo, Damascus, Dublin, Dubrovnik, Istanbul, Kiev, Kuwait, Larnaca, London, Manchester, Minsk, Moscow, Odessa, Rostov-on-Don, Samara, Skopje, Sofia, Split, St. Petersburg, Tashkent, Tbilisi, Tel Aviv, Yekaterinburg, Yerevan, Zagreb,Amsterdam, Athens, Barcelona, Berlin, Bologna, Bratislava, Brno, Brussels, Budapest, Cologne/Bonn, Copenhagen, Düsseldorf, Frankfurt, Hamburg, Hannover, Helsinki, Kosice, Krakow, Ljubljana, Madrid, Marseille, Milan, Munich, Oslo, Ostrava, Paris, Riga, Rome, Stockholm, Strasbourg, Stuttgart, Tallinn, Thessaloniki, Venice, Vilnius, Warsaw, Zilina and Zürich. Their charter flights go to/from Hurghada, Lanzarote, Las Palmas de Gran Canaria, Porlamar (Isla Margarita, Venezuela), Punta Cana (Dominican Republic), Rhodes, Sal (Cape Verde), Samos, Varadero and Zakynthos. There are a few dozen of other airlines serving some other destinations as well. Bus: To Prague centre, take bus number 119 to Dejvická metro station, and transfer on to the green metro line (Line A) or tram there, or bus number 100 to Zličín metro station (yellow Line B) which is further from the city centre. A trip takes about 40 minutes. After midnight when the metro line is closed, night-bus number 510 runs from the airport, offering 4 transfer points to centre-bound trams en-route. Also number 179 can be used for a longer but more interesting travel to Nové Butovice metro station (yellow Line B). Since 14 December 2008, the bus line AE (Airport Express) also provides nonstop service between Terminals North 1 and North 2, and the Prague Main railway station every day from 05:00am to 10:00pm, leaving every half hour. Car: rental cars and taxis are both widely available at the airport. Czech Railways operates trains throughout the country to and from Prague. Direct night trains connect Prague also with Cologne, Frankfurt, Amsterdam, Copenhagen, Zürich, Basel, Krakow, Minsk, Moscow and Saint Petersburg. Check the timetable for more information on buses between Prague and numerous cities and towns in the Czech Republic. Eurolines has international connections to and from Prague. Prague can be congested at times, especially during rush hour in the morning and late afternoon and on popular holidays. Parking is not overly expensive, but ideally you leave your car at home and visit Prague by public transport. Prague's public transportation is operated by the Prague Public Transport Company. It consists of metros, trams, buses, and a funicular. Tickets must be validated as soon as you enter the station or vehicle. Tickets are good for unlimited transfers for 30 minutes or 90 minutes, with passes for one, three, five and 30 days also available. Large backpacks and luggage are subject to an extra fee that must be purchased with your ticket to avoid fines. Tickets good for 1 or more days allow for one bag free. For a complete list of the latest fares, see this Prague Transport Company list. Use the Journey Planner to organise your travels and find connections between different modes of transports. Much of central Prague can easily be navigated on foot, including both banks of the river and crossing the Charles Bridge. In Prague everything is very geared towards tourists and you will pay western prices in many places. Head for the backstreets where you can get a very good three course meal for under €10. If on a tight budget there are many other eateries if you venture away from the tourist hotspots. Food is generally Goulash either with dumplings or in a hollowed out loaf of bread, roast pork or duck with red cabbage, snitzel etc. On Winceslas Square you can choose from a delicious array of sausages in a bread roll and wash it down with a beaker of hot wine. Perfect on a cold winters day. There are also many Italian restaurants, pizzarias plus of course McDonalds and Kentucky Fried Chicken! Pubs (in Czech "hospoda") abound throughout Prague, and indeed are an important part of local culture. The exact brand of beer usually vary from pub to pub, and recommendations are difficult to give as natives are usually willing to argue at lengths about their preferences. The most internationally recognized beers are Pilsner Urquell (Plzeňský Prazdroj) and Budweiser Budvar (Budějovický Budvar). There are other brands famous among Czechs like Gambrinus. If you are looking for a beer brewed in Prague, go for Staropramen. Usual prices for a half-liter glass are between 20 and 35 Kč, based on the brand and locality, while certain restaurants at tourist areas like the Old Town Square are known to charge more than 100 Kč for a euro-sized glass. There's also a booming craft beer scene with many brewpubs in the city. There are three main mobile phone operators using the GSM standard, their coverage is very good (except in some remote, mostly uninhabited areas). If you find using roaming with your own operator too expensive or you want to have a Czech phone number, you can buy an anonymous prepaid card from any of the three main operators. Ceska Posta is the national postal service of the Czech Republic. It offers good services with reliable, affordable and relatively fast delivery of postcards, letters and parcels. Postcards and letters weighing up to 20g which are being sent to countries within Europe cost 17 CZK, other countries cost 18 CZK. Within the Czech Republic, prices start at 10 CZK. Opening times of post offices vary but most of them are open from around 8:00am to 6:00pm or 7:00pm Monday to Friday, closing at noon on Saturday, closed on Sunday and public holidays. Larger and/or central post offices might keep longer hours and some have English speaking staff. You can buy stamps here, or at newspaper stands, kiosks or some small (souvenir) shops. Post offices offer a few other services, like (international) money transfers as well. FEDEX, DHL, TNT and UPS offer courier services as well, with fast but relatively expensive services. We have a comprehensive list of accommodation in Prague searchable right here on Travellerspoint. You can use our map to quickly compare budget, mid-range or top of the range accommodation in Prague and areas nearby. This is version 57. Last edited at 3:02 on Aug 2, 17 by sleepBot. 90 articles link to this page.